Last week, a $1.1 billion lawsuit against One Vanderbilt was settled, giving the green light to the 1,401-foot project. 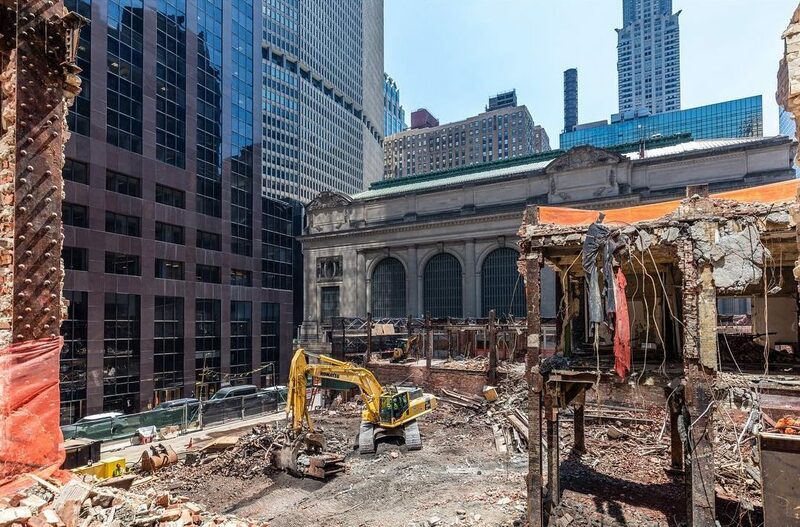 Investors at Grand Central Terminal led the suit, claiming that the tower would divest them of the value of their air rights if developer SL Green was was allowed to proceed with construction as it was cleared to do under the controversial Midtown East Rezoning. Now that it’s been dismissed, NY Yimby reports that excavation work is underway at the site of Midtown’s future tallest tower, at the corner of 42nd Street and Vanderbilt Avenue. And Curbed points out that architecture buffs can stay apprised of construction progress through the building’s new Instagram page. Construction workers hard at work, making #OneVanderbilt a reality. Behind the scenes look at #OneVanderbilt, on the inside looking out. Designed by Kohn Pedersen Fox, the building will encompass 1.6 million square feet, a mix of retail and office space. TD Bank is already lined up to occupy 200,000 square feet in the full-block base. As 6sqft reported in June, the project will cost a whopping $3.14 billion. Completion is slated for 2020.